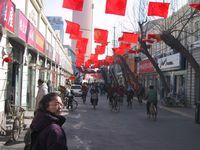 The weather warmed up considerably at the end of February, although it chilled down a little bit in the first week of March. We saw temperatures as high as 10 - 13 degrees Celsius (mid-upper 50's F). The change happened very quickly, going from freezing cold, heavy coat weather, to light jacket weather, in only a day or two. Here are some of the things that we have been doing in the month of February. 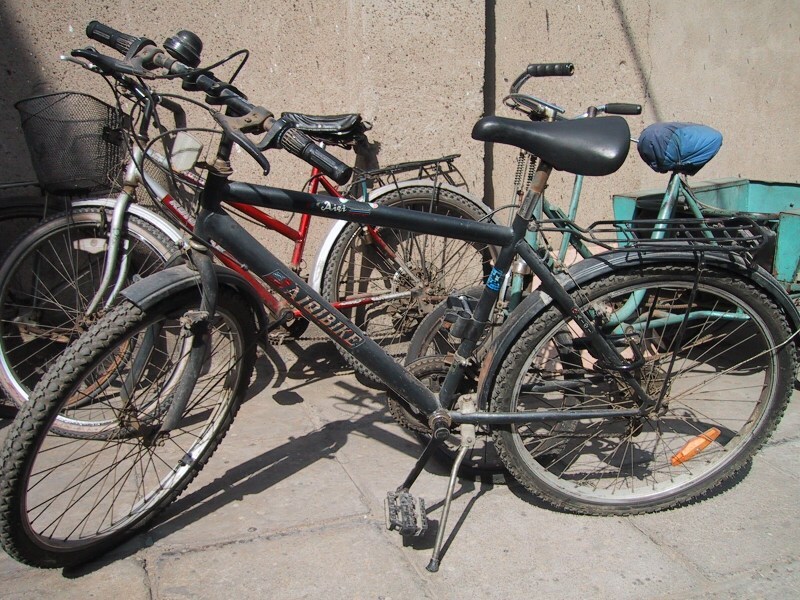 Almost all Chinese bicycles look more or less like this - camouflaged by a layer of dust and grime. Having a clean or new-looking bike would probably invite theft. The gears on this bike no longer work so it is stuck in one gear - but fortunately it is just the right gear for the flat Beijing streets and the occasional overpass. The seat needed to be replaced right away and in the first day's use, one of the pedals fell off and also had to be replaced. Due to a recent mishap, the handlebars are loose and the brakes no longer work, so before it can be ridden again, it will need some TLC by the bicycle repairman who sets up shop from a wagon-drawn mobile repair station just down the street from our apartment. 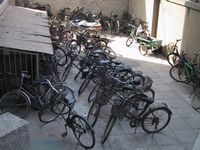 Here is where Bryan parks his bike, in the bicycle parking area outside our apartment. 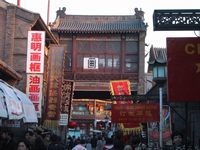 We took a weekend trip to Tianjin at the end of February. Tianjin is a city of millions (8 million, perhaps?) 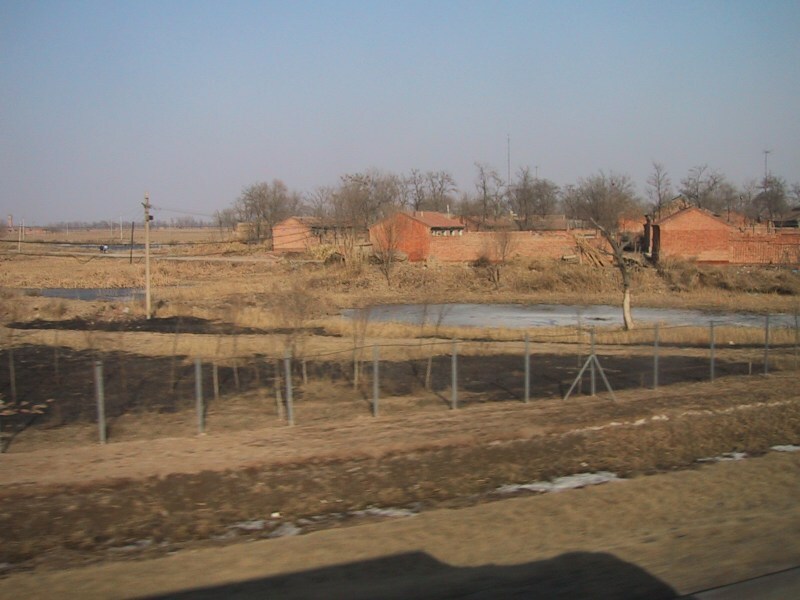 about two hours by bus east of Beijing. 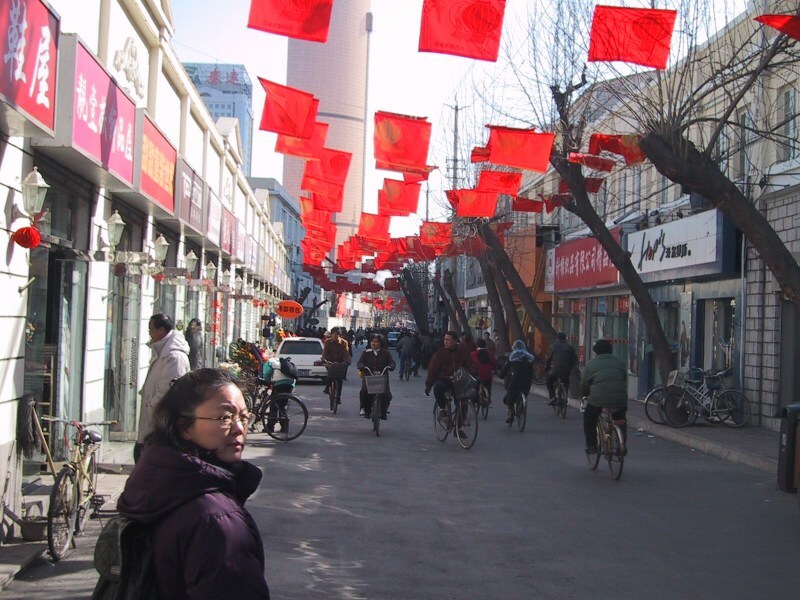 Like Beijing, it is a very big city, in terms of land area, so its very large population is spread out, and it doesn't seem nearly as large as its population figures would suggest, once you are in it. 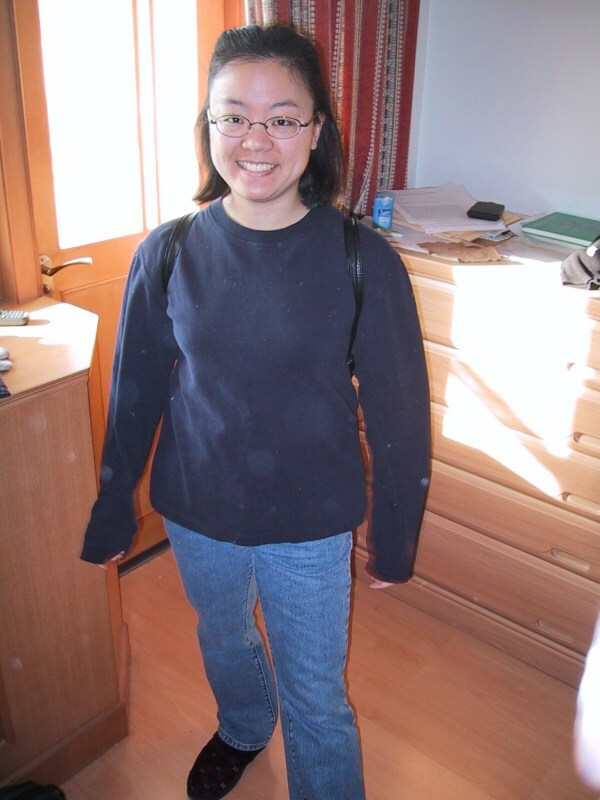 Nancy looks excited to leave for the train station. 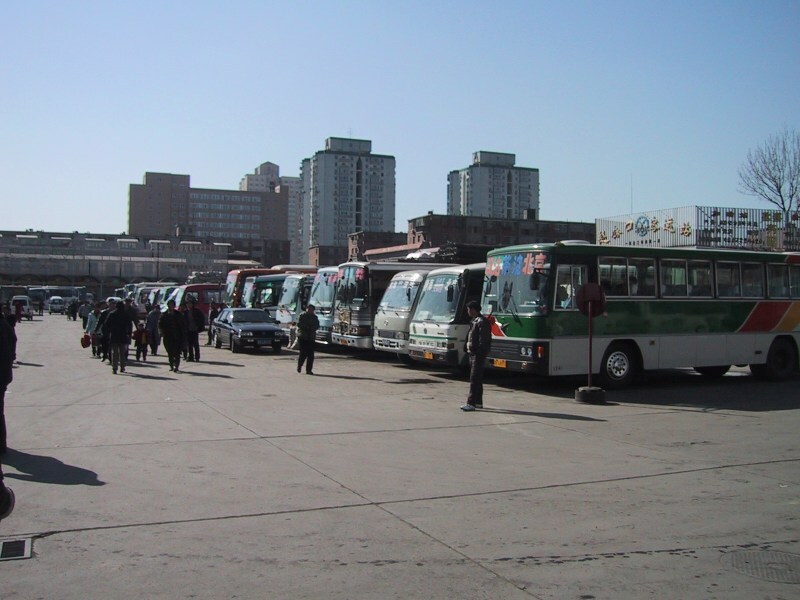 Here is the Beijing bus station. 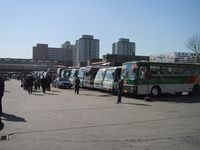 Busses leave frequently for Tianjin, on the order of twice an hour. 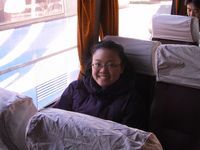 Nancy's on the bus waiting to leave for Tianjin and still very excited. 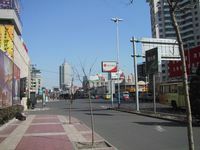 Tianjin from outside the bus station. The bus on the way to Tianjin had some mechanical difficulties but we were only 15 minutes or so late. 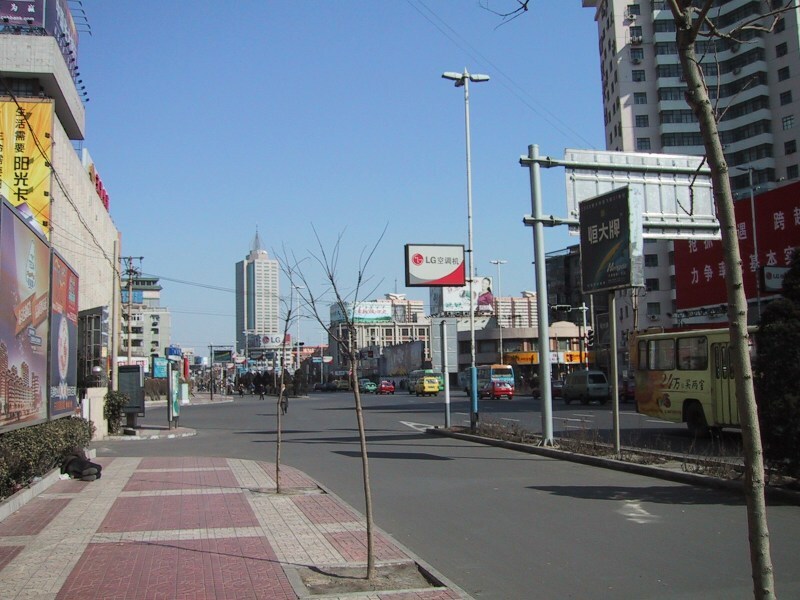 Our first impression of Tianjin was that it was alot like Beijing, but somewhat cleaner. We were hungry, so we wandered around looking for someplace to eat. We settled on a little place that turned out to be a Korean barbeque restaurant. Then tragedy struck. We were informed that the restaurant had no hot tea and no bottled water. This dilemma meant that Bryan had to either violate his "water and tea only" policy, or drink a beer or soft drink. 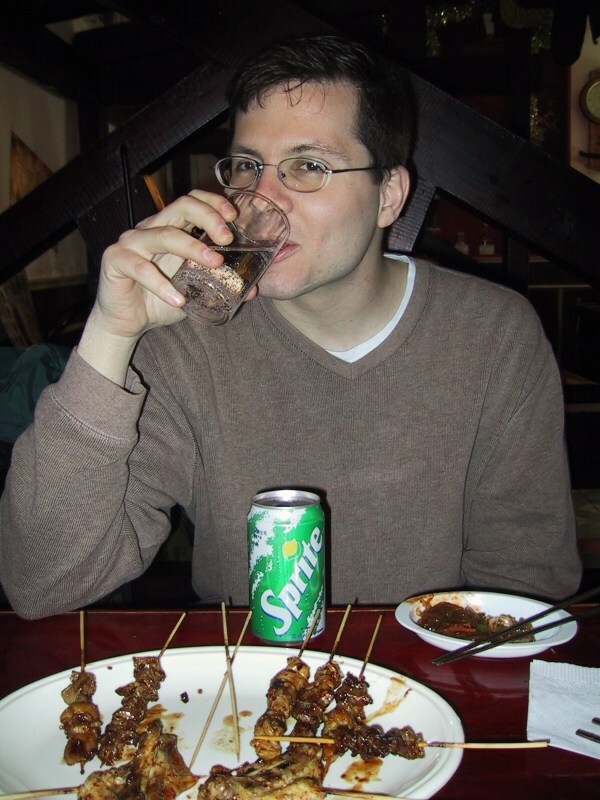 At first he bravely tried to endure the salty meal without drinking anything, but eventually his thirst prevailed and he was forced to order a Sprite. Here you see Bryan drinking the first sip of soft drink he has had in over two years. And what was the verdict? "Yuck - disgustingly sweet. I hope I don't have to drink another for at least two more years!" 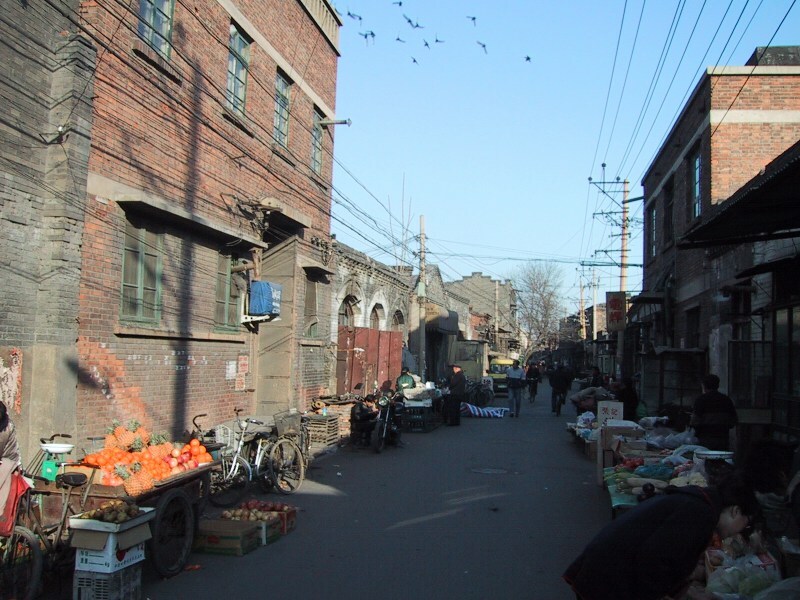 This is a panoramic shot of the "old China" part of Tianjin that we could see from our hotel window. We decided to investigate. 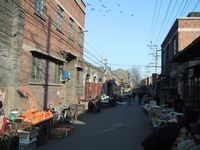 This is an alley in the Hutongs. 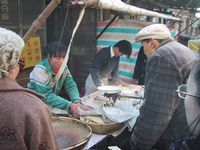 It has a village-like feel, with street vendors selling food and small items by the side of the road, and people saundering or bicyclying by. It was here that we became acquainted with one of the bigger differences between Beijing and Tianjin. In Tianjin, foreigners are much less common, and so people stare alot. We could have been Martians shipwrecked in Tianjin given the way people stared. 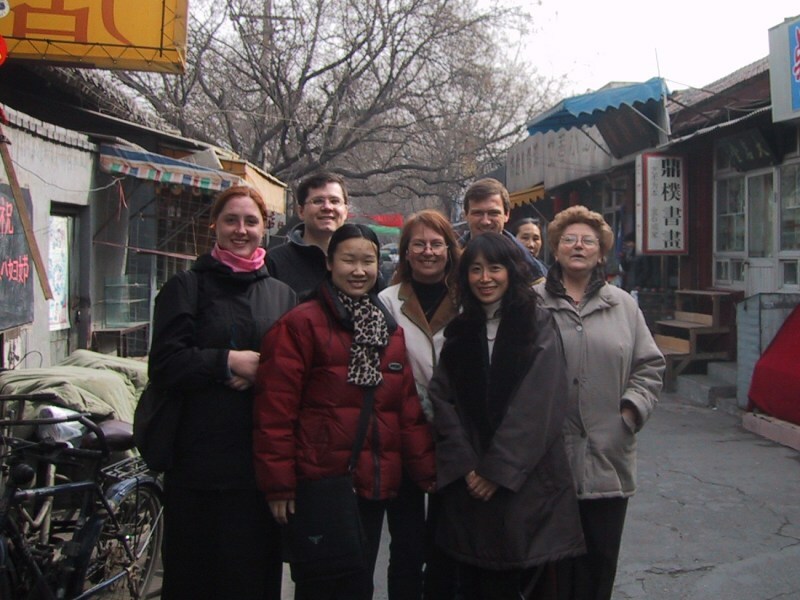 In Beijing there is a bit of staring, but generally only in the parts of Beijing that foreigners rarely (if ever) go, which is where we spend 99% of our time. 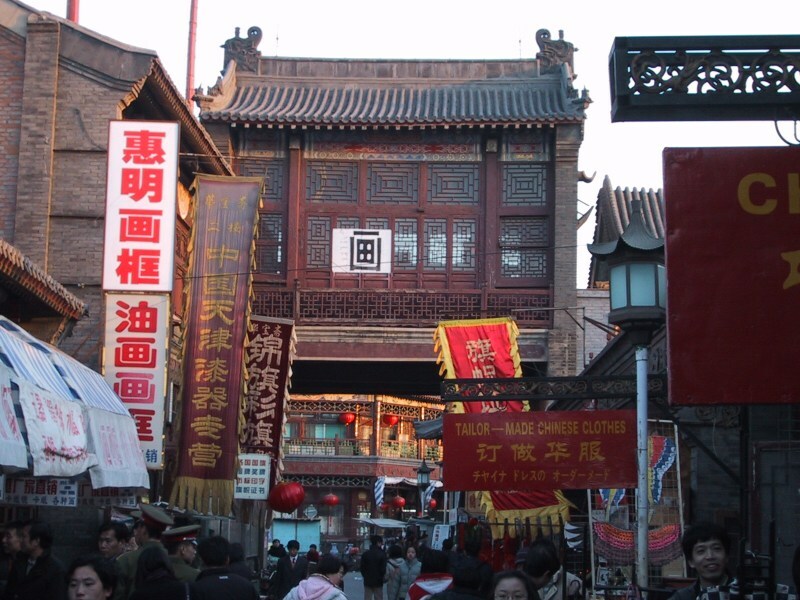 In Tianjin, every place is a place foreigners very rarely go. 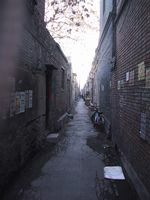 Here is a narrow alley in the Hutong. They are full of such alleys, as they are in Beijing, and it is in places like this that the majority of the "middle" to "lower" class people live. Some street vendors were making fried dough bread. 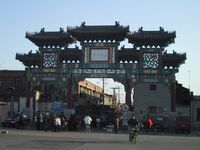 Tianjin has its share of Chinese archways. 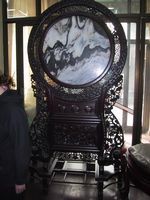 Here is one of them, at one of the main walking entrances to the "old China" area. Tianjin also has its share of "market" streets, with shops and street vendors selling every kind of Chinese antique, both real and (mostly) fake. 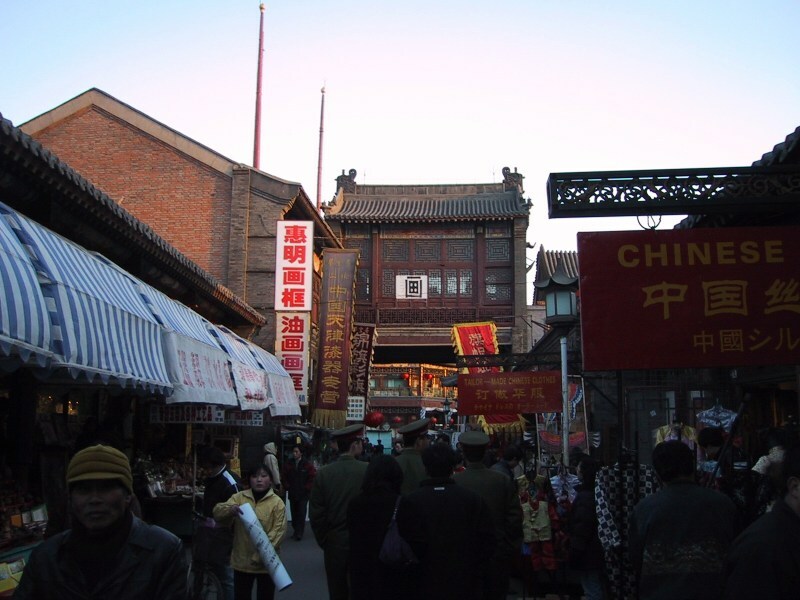 A closer look at the Chinese architecture of the market street. In Tianjin we saw something that we haven't seen in Beijing. 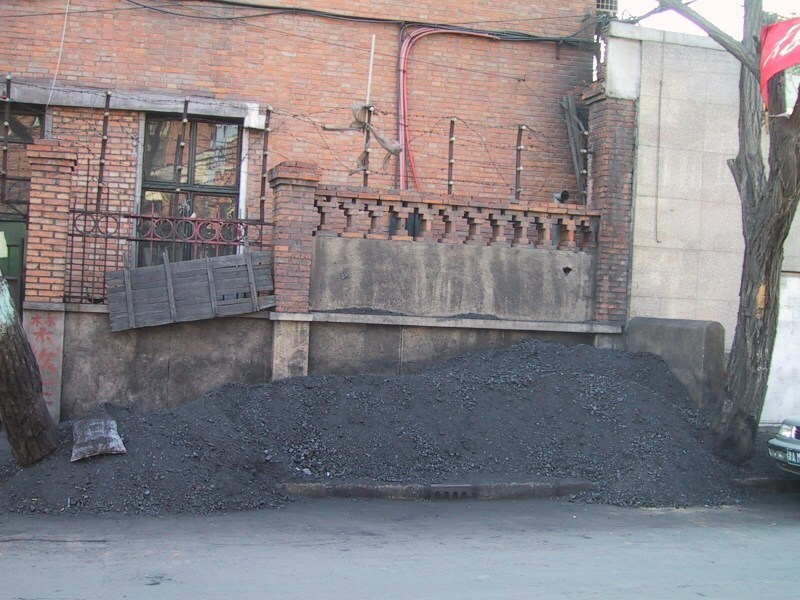 In both Tianjin and Beijing (and probably all of China), coal is still a major source of energy, especially in the Hutongs. 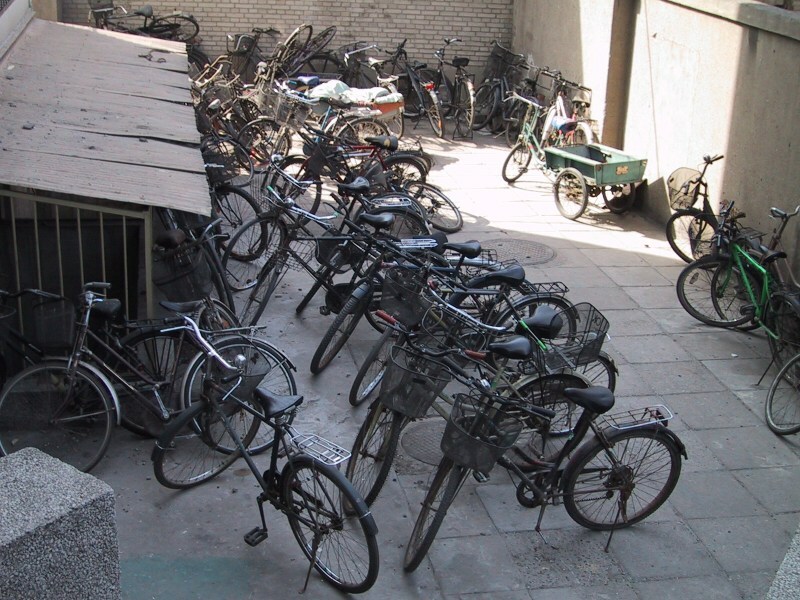 Men on bicycle carts loaded with coal bricks are a frequent sight in Beijing and Tianjin. 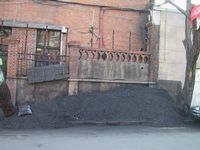 But in Tianjin they go a step further - we saw many places where coal dust, perhaps waste dust from the coal brick manufacturing process, or maybe the remains that are shaken off as the coal is delivered, is collected and heaped up into huge piles. 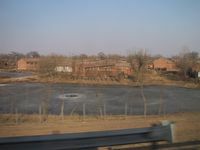 Then water is added to the pile and the coal dust paste is spread out and left in the sun to dry, presumably into hard bricks which can then be burnt as fuel. 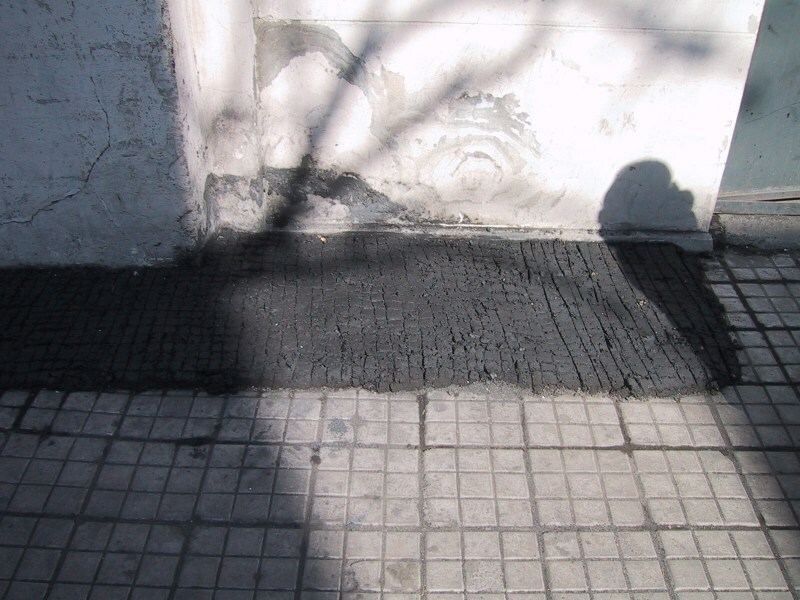 We saw many old men and women spreading coal dust paste out onto the sidewalk like this. Our theory is that it is a cheaper way to buy coal, as the leftover dust, which you must then turn into burnable bricks yourself using water and patience. The above photos were shot from the bus window on the way back from Tianjin. 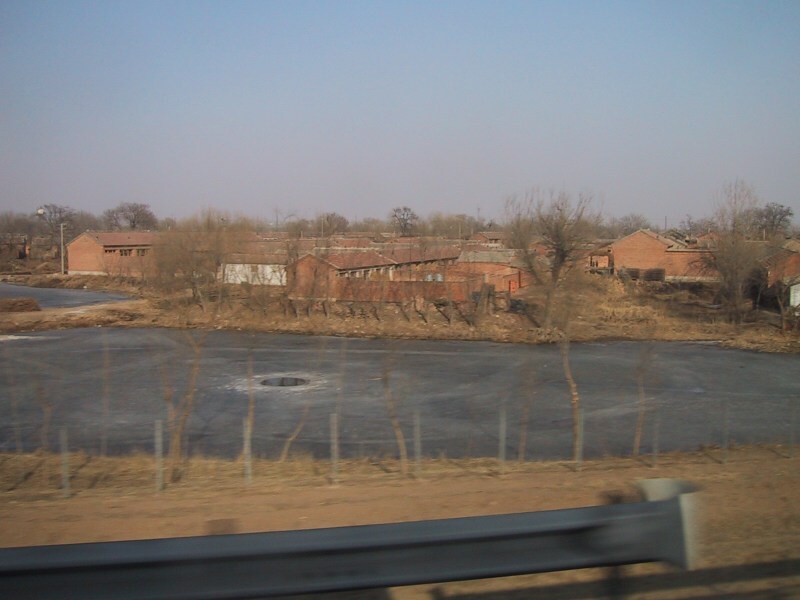 They given some idea of the fairly bleak landscape outside of the cities in northern China. We have to give Tianjin mixed reviews. The antique market which our travel book raved about was very disappointing. The restaurants we chose to eat in were pretty poor. There isn't too much about Tianjin that we felt would recommend it over Beijing. The most interesting thing was the fact that people stared like mad at us as we walked around, and we nearly caused several bicycle accidents as people rubbernecked on the way past us. Oh, and our hotel had CNN on the TV, so we got to see a little bit of Western news, and an American breakfast, so we had our first (and probably last) french toast in China. Bryan's Chinese language class at the Bridge School has been a very good one. 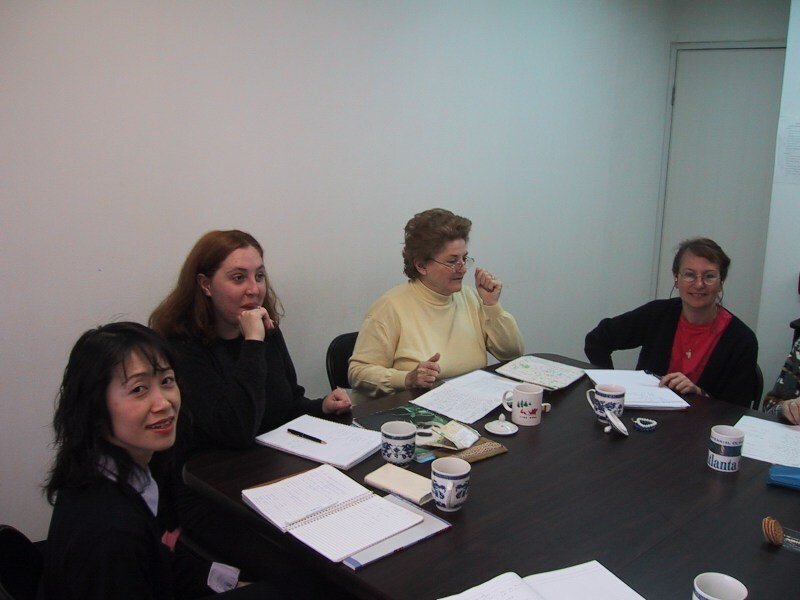 The class is quite diverse, with one Australian student, one Japanese student, one Italian Lebanese student, one Inonesian student, and two Belgian students, in addition to Bryan. 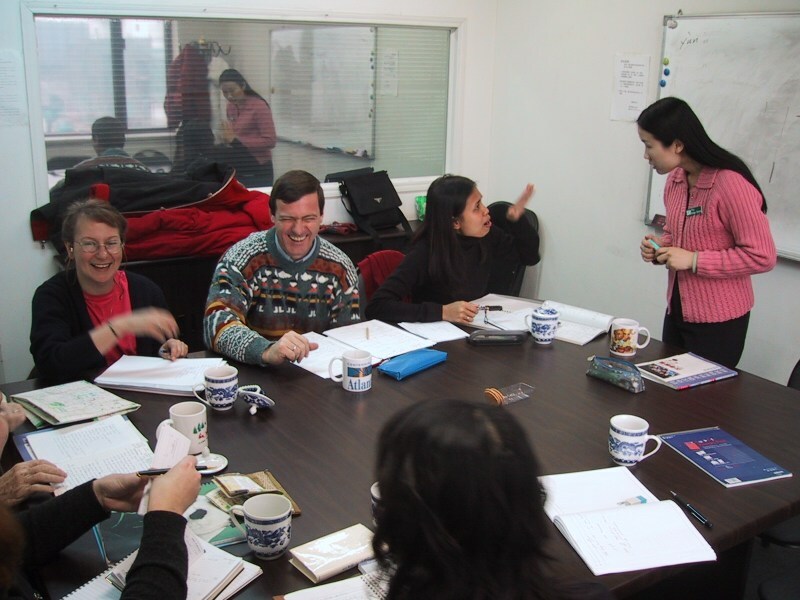 The other members of the class, with the exception of the Australian, are business people or the wives of businesspeople who have been stationed in Beijing. The class turned out to be very social and Bryan enjoyed many lunches and other social events with the other students. Here is the teacher, Jenny, and the Belgian students, Claudine and Alex, along with the Indonesian student, Ika. Here we have the Japanese student, Keiko, along with the Australian, Alexa, the Italian Lebanese, Theresa, and once again Claudine. The most impressive aspect of this bunch is that amongst the seven students, we had fluency in Japanese, Italian, French, English, Arabic, German, Dutch, and Indonesian. And given that Bryan only speaks English, we can see that the others speak an impressive array of languages. Of course, the common language, and the language in which the class is taught, is English. 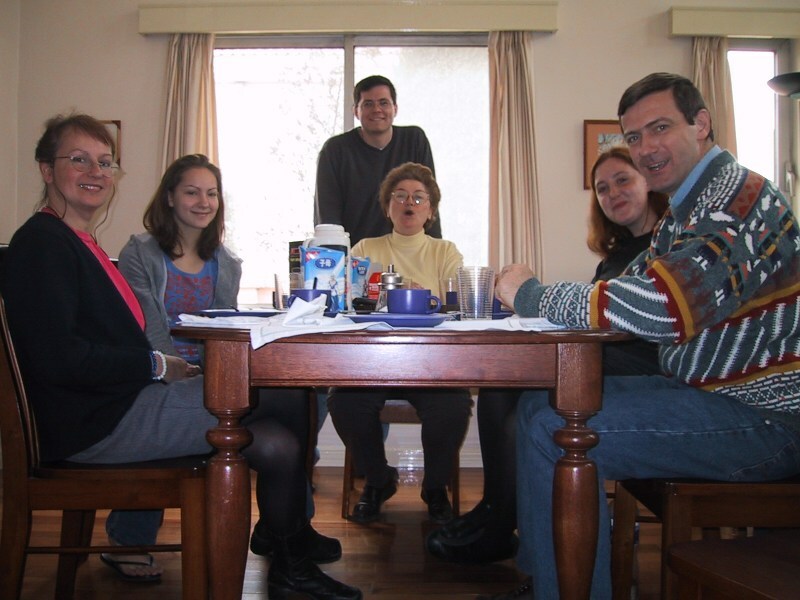 Claudine and Alex invited everyone to their place for a nice Belgian lunch after class one day, and here we all are, along with their daughter, Catherine. 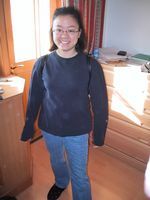 They live in a complex of foreigner housing on the outskirts of Beijing near the airport. It is a bit strange to have a California-style walled stucco development complex stuck in the middle of the plains on the outskirts of Beijing, but the units themselves are very nice. 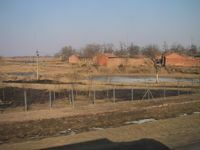 Foreigners living (officially) in Beijing can only live in places approved for foreigners, such as this one. As Alex jokingly puts it, it is a "happy prison". For class one day we went on a "field trip" to some famous antique market in Beijing. It was mostly touristy but there were alot of nice things on display. Here are Keiko and Alexa outside one of the shops. I'm not quite sure what this is exactly, but it is pretty. 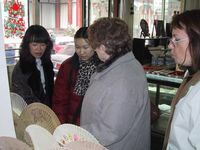 Keiko, Jenny, Theresa, and Claudine consider some of the wares. We were a pretty frugal bunch and I think that amongst the lot of us, the only purchase for the whole day was some Chinese writing papers. 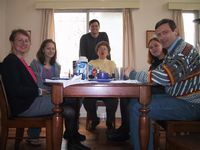 We also had an excellent lunch at Theresa's very posh apartment one Saturday. The Lebanese meal prepared by Theresa was incredible. It was the first time that everyone (except Theresa, Nancy, and Bryan) had eaten middle eastern food, and we all thought it was great. The above is a (poor due to a low lighting situation and poor photographic skills on the part of Bryan) group photo. 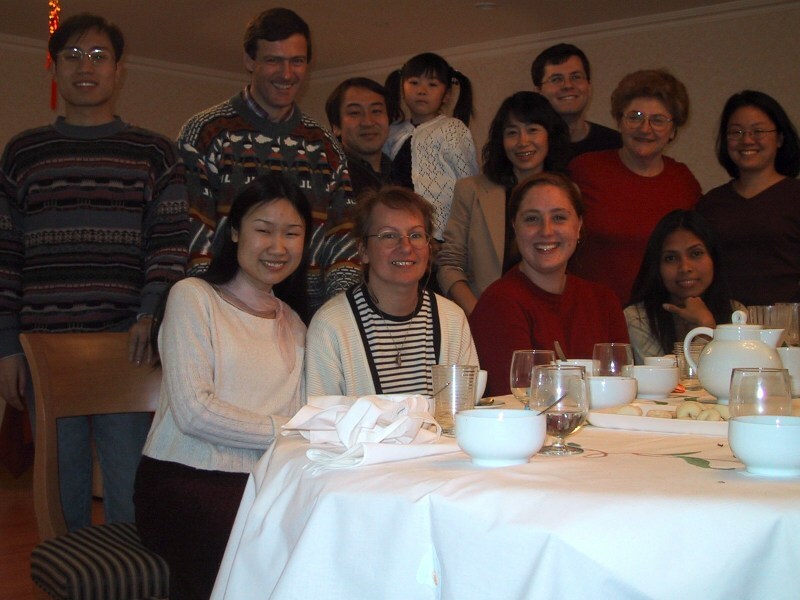 We have Jenny's boyfriend (whose name we unfortunately can't remember), Alex, Keiko's husband Hata, Keiko's daughter Marika, Keiko, Bryan, Theresa, Nancy, Jenny, Claudine, Alexa, and Ika. Keiko and Hata's daugher Marika is such a cutie! Nancy with Keiko and Hata. For the last three weeks of March we will be travelling in Hong Kong, Taiwan, and southern China, so although you won't hear much from us until April, expect alot of great stories and photos next month!